Jill is only working on her Jenica Hoodie out of Cascade Ecological in dark natural brown. 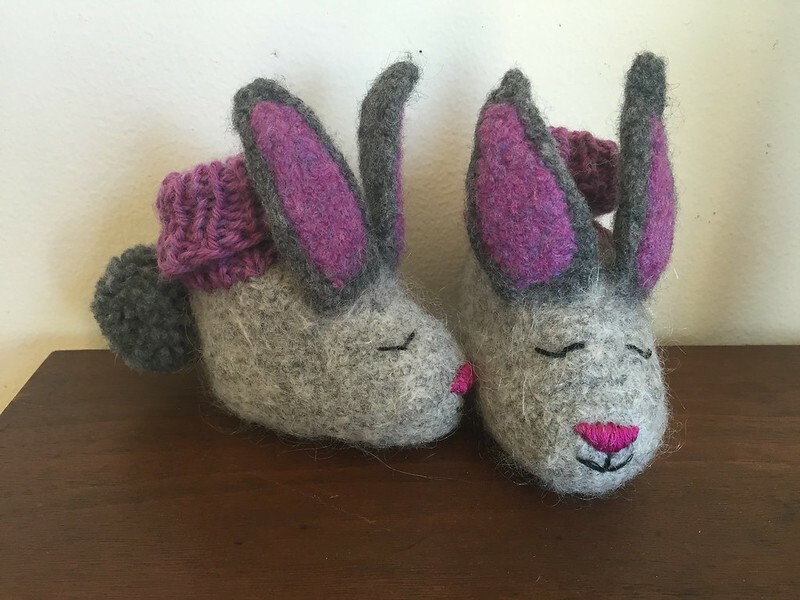 She has finished the bunny baby booties, using the Animal Friends Felt Baby Booties pattern. She used Lamb's Pride Worsted, some old handspun and Cascade 220. Her Rav page is here. Michele will continue her old projects but has lost interest. She will start the Braided and Broken Wrap by Cre8tion Crochet in Lion Brand Heartland. She is also going to start the Lyndhurst Cowl in Bernat Multi-ply in grey/yellow/black. Michele has been looking at cowls. She is looking at the Bandana Cowl by Purl Soho. Another free crochet pattern is the Forest Fog cowl. She likes the Katniss Cowl by Kahi Dahls. (There are a ridiculous amount of different takes on this pattern out there. Just search Katniss to find them all.). She likes how Outlier by Laura Aylor looks like a shawl, but is a cowl. She loves but will never make the Pop Blossom Cowl by Thea Eschliman. There is also a hat pattern of it. Jill is obsessed with a bunch of different patterns. She loves the DC superhero christmas ornaments by Lexie Bryan. She also bought the Oh Christmas Tree hat by Jenny Wiebe, and the pattern purchase goes to a good cause. She thinks Waverleaf by Faye Kennington would be a good stash busting project. 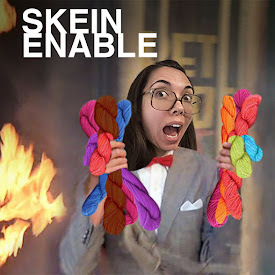 It may also be a pattern that is part of the Indie Design Gift-a-Long. (Check out that group! The Gift-a-Long starts November 19 and runs through the end of the year.) A pattern that will definitely be part of the Gift-a-Long is the Persian Dreams Worsted weight blanket by Jenise Hope. There is also the Venus Cowl by Alexandra Davidoff which would be great for a gradient yarn. Family Feud with Richard Dawson on Buzzr.